The global clinical trial packaging market is expected to see a steady growth in the forthcoming years, according to a recent report by Transparency Market Research (TMR). The market scenario is exhibits intense competition and fragmentation at present. The top five enterprises collectively held less than 15% of the total market share in 2017. Vendors in the industry are being receptive to needs of large pharmaceuticals that are developing novel drugs, and are targeting such enterprises. 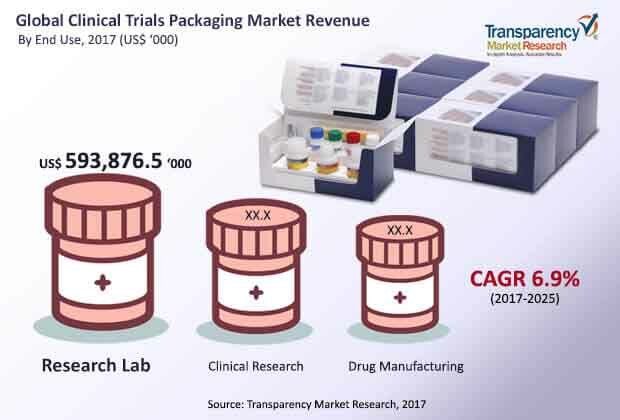 Key players in the clinical trial packaging market are Westrock Company, PAREXEL International Corporation, Almac Group Limited, Bilcare Limited, Fisher Clinical Services, and Sharp Clinical Services, Inc.
TMR projects global clinical trial packaging market to be at nearly US$919.92 mn in 2016. The market is predicted to expand at a healthy CAGR of 6.9% during forecast period 2017 to 2025 and rise to a valuation of US$1.66 bn by the end of 2025. Of the key packaging types examined in the report, the segment of bottles dominated the market in 2017, holding nearly 65.1% of the global market. The segment is also likely to retain its dominant spot during the forecast period. Geographically, the market in North America is anticipated to lead the global clinical trial packaging market during the forecast period, registering the highest CAGR of 7.7% in terms of value. The higher rate of occurrence of chronic diseases such as HIV, cancer, and epilepsy is a key factor responsible for the growth of the clinical trial market. The surge in demand in the market is leading to increased outsourcing of drug discovery services and efforts are being undertaken to determine the toxicity level in the early stages of drug discovery, which may lead to the clinical trial packaging market growth. Increasing emphasis on the research and development in various countries coupled with rising government funding for development of new drugs is predicted to help augment the growth of the market. New entrants in the market are focusing on launching new products and adopting new technologies, which is further influencing the market in a positive way. Lack of infrastructure and inadequate trained professionals are factors that are restraining the clinical trial supplies market to some extent. A variety of plastics have emerged in the packaging industry in the recent years and have led to rapid advancements in technology including extrusion blowmoulding, injection blowmoulding, and 3-D designing software tools for the improvement of product designs. Currently plastic accounts for a large share in the global clinical trial packaging market, however, the negative environmental impact of the accumulation of non-biodegradable and non-recyclable plastics is compelling companies to focus on the development of sustainable products such as bio-based plastics. The global clinical trial packaging market is predicted to witness robust growth in the upcoming years, on account of the rise in the number of clinical trials across the globe, the outcome of which is the emergence of the clinical trial packaging market. Due to rising number of discoveries of new drugs in research laboratories across the world, the global clinical trial packaging market is receiving a considerable lift.